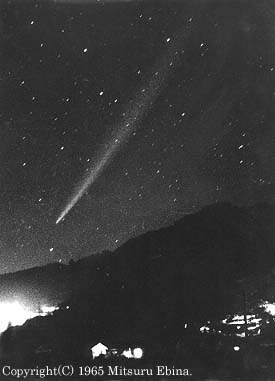 The comet passed perihelion on October 21 and was visible in the pre-dawn skies all over Japan. In early November it was at its grandest with a 40-degree-long narrow tail streaming from the first-magnitude core. This photo was taken by Mr. Mitsuru Ebina as it was seen from the "hot spring" town of Emukae in Nagasaki Prefecture.